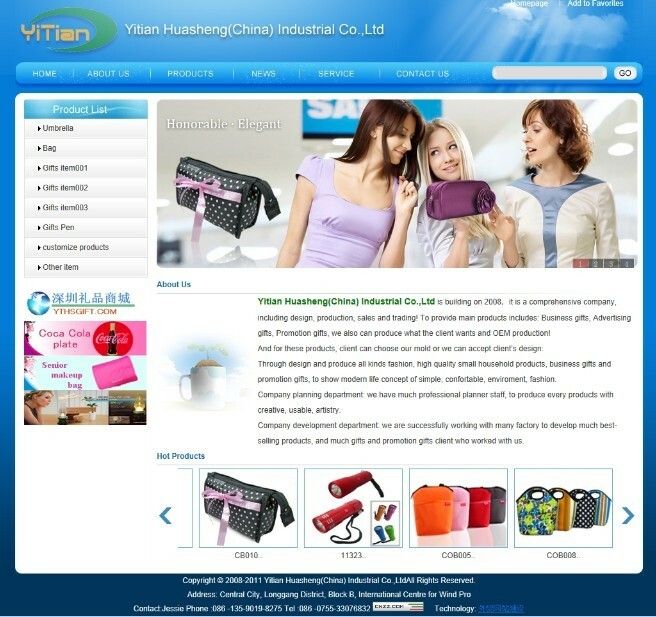 Yitian Huasheng(China) Industrial Co.,Ltd is comprehensive company, including design, production, sales and trading! To provide main products includes: Business gifts, Advertising gifts, Promotion gifts, Healthy gifts, we also can produce what the client wants and OEM production! And for these products, client can choose our mold or we can accept client’s design: Fashion bag, Handbag, Comestic bag, Wash bag, Sports bag, Leisure bag, Cooler bag, Recycle bag, and other products about the case and bag! Umbrella: Golf umbrella, Beach umbrella, Straight umbrella, Kits umbrella(Children umbrella), Folding umbrella, Automatic open umbrella, Advertising umbrella! We have top designer and excellent sales team, with broad commodity information! We are develop new products, and service to our client with top quality with best service, our products sale to worldwide, and now we are to be much company’s appointed Chinese supplier, we are expecting to cooperate with much world wide client! Our company insist on idea about” Professional knowledge about the products, top quality, Competitive price, Good faith, Green enviroment”, to service every client! Our idea: The reason of our existence is to solve client’s problem, with best service and green enviroment! Our goal: To get your trust and support through our best service and heart, and win-to-win!